In the world of mental health, anxiety is recognized as the most common disorder affecting individuals of all ages. According to the National Alliance on Mental Illness (www.nami.org), about eight percent of children and teens in the United States experience the negative impact of anxiety. These numbers are startling. For me, most troublesome is the fact that less than twenty percent of the surveyed teens with an anxiety disorder received mental health care. 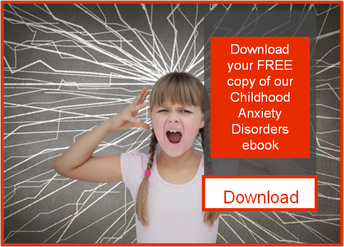 As adults who are responsible for the care and well-being of children it’s important to be informed about anxiety in children so we are equipped to appropriately respond. What is anxiety in children and what does it look like? presents itself, our senses are heightened, we’re extra alert, and we’re ready to mobilize. Consider an individual riding a motorcycle, driving through heavy traffic, or performing on stage. Anxiety helps these individuals pay attention, stay safe (and avoid other cars on the road), and devote energy to nailing the task at hand. However, some individuals experience anxiety when no real danger exists. The recurrent experience of anxiety to the point that it negatively impacts one’s everyday life may mean the person is suffering from an anxiety disorder. The Diagnostic and Statistical Manual of Mental Disorders 5th edition, explains that for someone to be diagnosed with an anxiety disorder, the anxiety must be “excessive” and “(persist) beyond developmentally appropriate periods” (p. 189). For example, one anxiety disorder described in the DSM-5 is Separation Anxiety Disorder, where the key feature is “excessive fear or anxiety concerning separation from home or attachment figures” (191). Consider that while this can be classified as a disorder, periods of heightened anxiety in relation to separation from primary caregivers is a natural and expected part of healthy attachment development. NAMI categorizes symptoms of anxiety into two types of experiences: emotional and physical. If you know someone who appears to be suffering from excessive anxiety, don’t sit back quietly. Anxiety is treatable and the earlier that intervention begins, the better. Speak to your child’s teacher, school psychologist, social worker, or pediatrician if you suspect that your young one is in need of help.